What is the #1 secret to lasting sciatica pain relief? Because judging by the number of people who contact my chiropractic practice with unresolved sciatica pain, there are many, many people who haven’t discovered it. Even people currently being treated for sciatica by all the popular methods mentioned in this article. So, here it is. The #1 secret to finding lasting sciatica pain relief: take lasting pressure off of the sciatica nerve allowing the nerve to heal. anything that places pressure on the sciatica nerve from the low back all the way down the leg can create sciatica symptoms. Anything. Any inflammation of any tissue near the sciatic nerve. That’s a lot of tissue, in a lot of places. So that’s plenty of opportunity for the sciatica nerve to go wrong. So, what should you do about it? Here is one way you can think about it. In order to remove pressure on the sciatica nerve, you have to remove unnecessary pressure on the tissues that can affect the sciatica nerve. 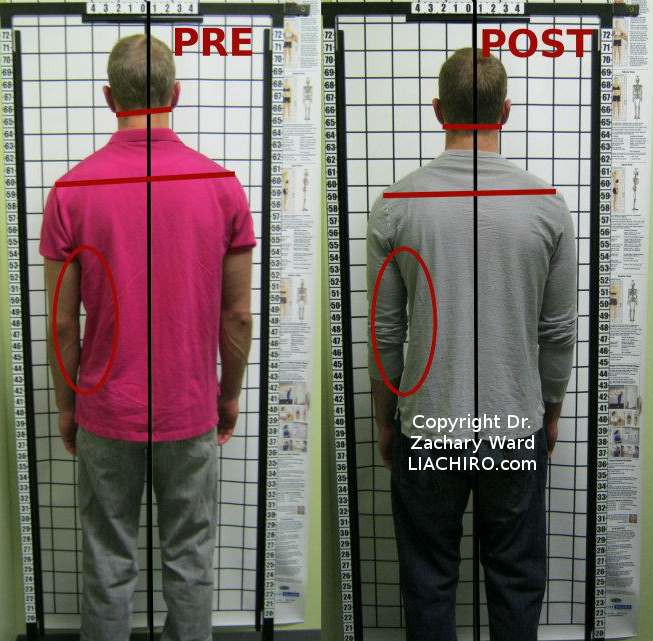 And what’s the easiest way to change the structure of the spine and posture in a short amount of time? Release the tension of the neck. Yes, you read that right. Release the tension of the neck. In my chiropractic experience, both as a doctor, and as a patient with a history of spinal pain – the neck is the missing key. Does that mean get a deep tissue massage? That might be helpful, but in this case we are talking about releasing the problem joint alignment of the neck, created by a bunch of little injuries. And the body’s breakdown over time. It is the upper cervical subluxation complex in chiropractic jargon. You don’t need to remember that. But you might want to remember these pictures. 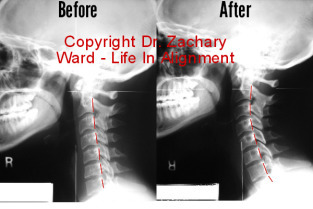 Both of these images are of patients at Life In Alignment Chiropractic in Auburn Hills, MI. Both came in with classic sciatica pain symptoms. Can you see the distortion in their posture? Can you see the way this distortion shifts to be being more balanced? The patient in the top image experienced chronic sciatica pain in the right low back and right leg. Maybe you can see why. 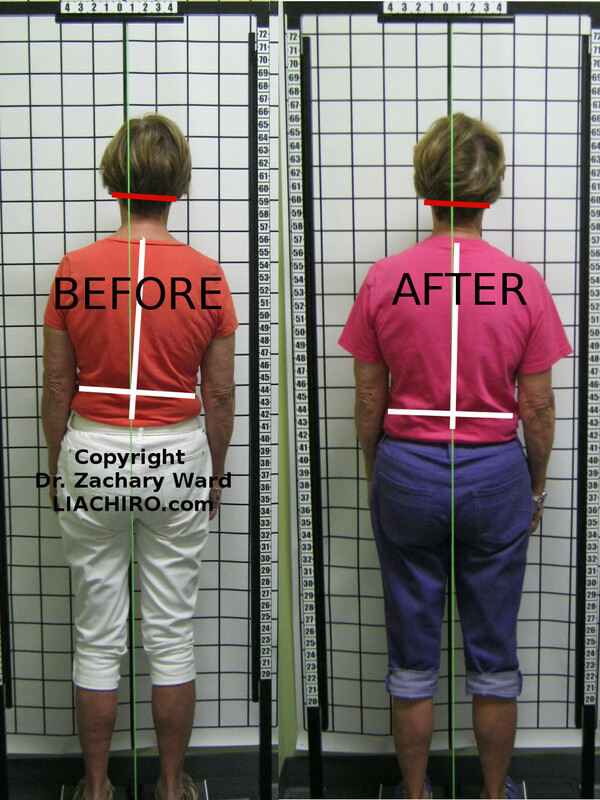 Both have seen either a major decrease in sciatica symptoms or complete elimination by helping their distorted spine alignment, by first correcting the neck. Gently. That’s it. That’s what produced these changes. This is the #1 secret for l asting sciatica pain relief for many, many people. Release the pressure on the sciatic nerve by releasing pressure on the human frame created by an overlooked problem in the neck. Ultimately that isn’t so obvious. Which is why almost no one is offering this service. If you are in the Metro Detroit area and want a second opinion on your sciatica symptoms and pain, then request a consultation via the contact form, or simply call the office. (248) 598-4002. And by the way…the images shown in this article did not take place over months or years of care. The top image shows the change after the first correction. One visit. And the second image shows the change after four weeks.